Stockbridge, MA, April 11, 2018—To celebrate the 9th annual Art Museum Day, Norman Rockwell Museum announced today that it will offer free admission on Friday, May 18, 2018. An initiative of the Association of Art Museum Directors (AAMD), Art Museum Day gathers hundreds of institutions from across North America to recognize the arts and the important role that art museums play in their communities. 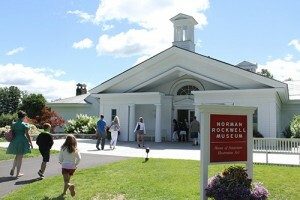 This year, Norman Rockwell Museum is presenting exhibitions on the art of Norman Rockwell, pulp fiction artist Gloria Stoll Karn, as well as the final days of Never Abandon Imagination: The Fantastical Art of Tony DiTerlizzi; Museum curators will give a special tea and talk about the DiTerlizzi exhibition at 1:30 p.m. Norman Rockwell Museum will also opened Norman Rockwell’s Stockbridge studio, located on the Museum’s grounds, for public viewing during the summer and fall seasons. Regular Museum gallery talks will also be provided at 11 a.m., 12:30 p.m., and 2:30 p.m. A number of digital interactive components will also complement the Museum’s exhibitions and programs. Norman Rockwell Museum invites visitors to share their experiences on Art Museum Day via social media, with the hashtag #ArtMuseumDay. AAMD’s Art Museum Day is an opportunity to focus attention on the role of art museums in North America, an extension of the International Council of Museums’s (ICOM) International Museum Day. AAMD represents 240 art museums across the United States, Canada, and Mexico—from regional museums in small towns to large museums in major urban centers. Last year, YOUR INSTITUTION—along with more than 161 other AAMD member museums—participated in Art Museum Day. A comprehensive list of participating AAMD member art museums will be available on the AAMD website. Note that while AAMD’s Art Museum Day and ICOM’s International Museum Day are formally held each year on May 18, some institutions shift their celebrations to adjacent dates.